Published in part on KCET EarthFocus for a series on urban biodiversity in Los Angeles (link). 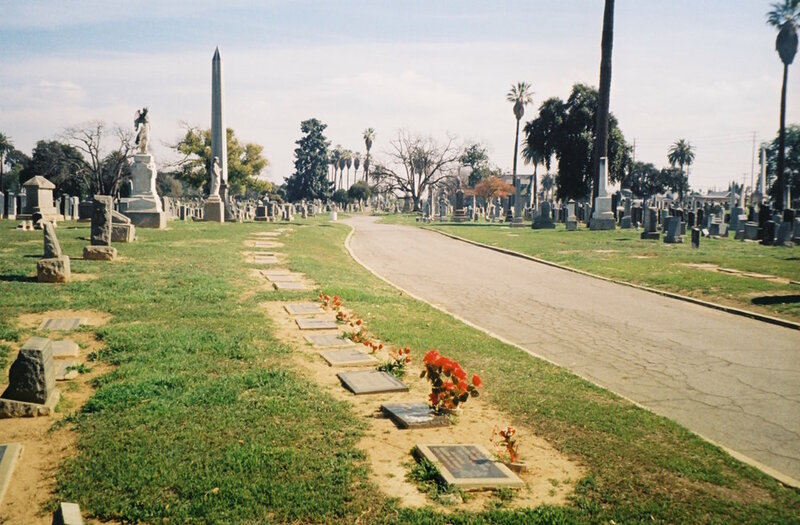 Evergreen Cemetery, in Boyle Heights, is the oldest cemetery in Los Angeles and one of the largest with over 300,000 graves. People visit the cemetery to commune with deceased loved ones, sometimes leaving what seems to be their favorite foods in life at their graves as offerings in death. How many of these gifts intended for the dead end up in the bellies of the coyotes who also dwell here? UCLA Professor of Anthropology Jessica Lynch-Alfaro observing a coyote through her binoculars. In the early morning the coyotes are far more active than they are in the late afternoon, when they mostly laze about in the sun or sleep under the shade trees. The coyotes use the cemetery and surrounding neighborhood as a hunting ground. 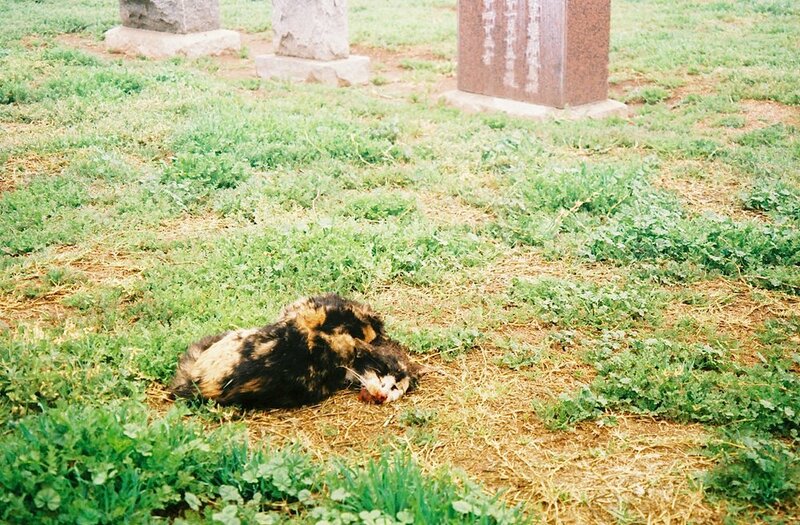 This coyote is just returning to the cemetery with a dead cat, and the cat’s cadaver suggests that it was caught and killed by the coyote, rather than picked up as roadkill. Many birds of prey also find the cemetery to be a rich hunting ground. Pictured above is a Red-tailed Hawk sitting high atop a pine tree, and two American Kestrels, the smallest and most common falcon in North America, perched together on an angel's wings. After nearly catching a squirrel, a coyote is left despondent. 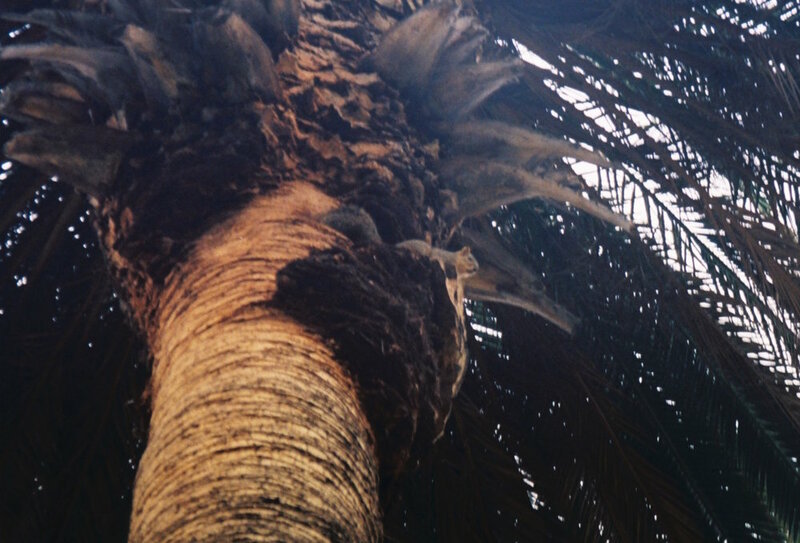 The squirrel, having escaped with its life, sits looking down from the taut bows of a large palm tree. Three of the groundskeepers at Evergreen, Jose, Juan and Elias (from right to left), take a break to drink coke in the shade. Jose (pictured second), who has worked at the cemetery for 25 years, says the coyotes appeared here about two years ago during a large fire in the surrounding mountains. They all leave small receptacles to catch the dripping water from the spigots that cover the cemetery grounds, little watering holes for the coyotes. 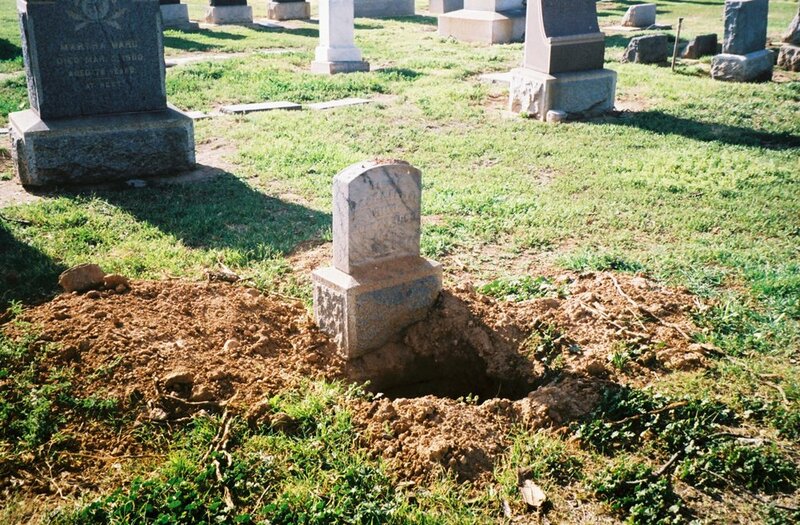 A coyote has dug a den near a grave stone that extends to the space underneath the root of a large nearby tree. The cemetery groundskeepers believe the female coyote is pregnant and will soon deliver a litter, giving birth to new life among the dead. In the late afternoon sun, coyotes often sleep peacefully among the gravestones. At my approach, this coyote got up and ambled away. 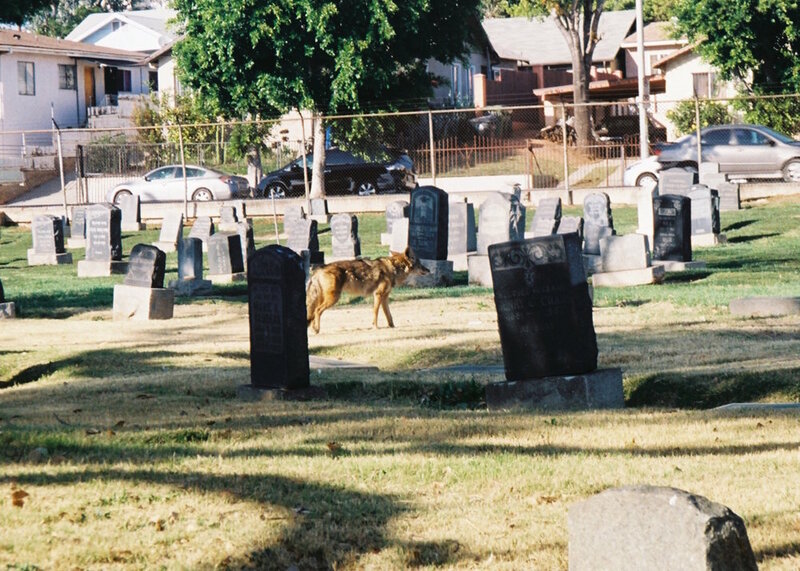 Since the cemetery is surrounded on all sides by busy streets and a flight path is directly overhead, the area where the coyotes dwell is enveloped by a cocoon of white noise, making close encounters all the more possible. 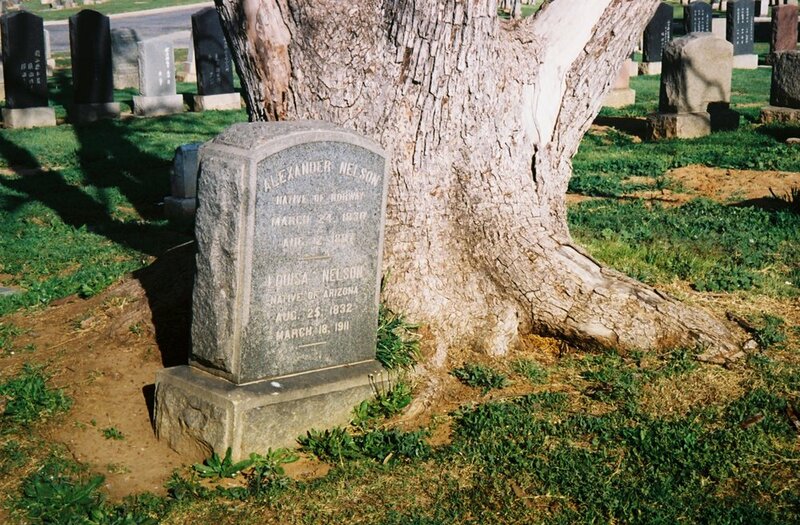 The graves in the cemetery are largely segregated on racial lines. Pictured above is a small portion of the many Japanese graves, tightly packed, and the White section, which is spacious and contains by far the largest tombstones. Matthew says he comes to the cemetery because he "enjoys being close to death." 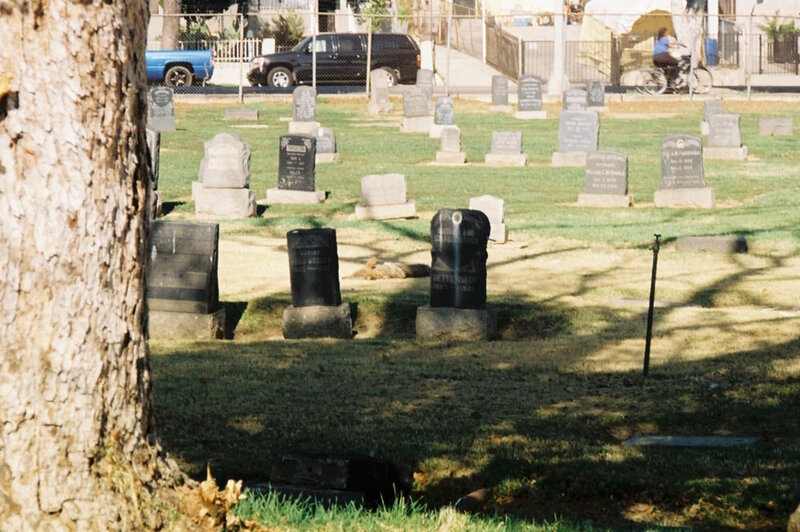 Many local residents jog or walk for exercise around the cemetery's outer edge, and RV's line the street on its Western fence line.